STATE HOUSE – Rep. Teresa Tanzi, a longtime ardent advocate for the state’s bike paths and bikeable community development, today expressed her excitement that the completion of two new spurs of the William C. O’Neill Bike Path will soon be funded. 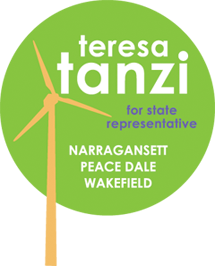 Representative Tanzi is a founding member of a coalition called “Paths to Progress,” which formed in 2015 to advocate for the expansion and connection of bike paths in the state, including the completion of the William C. O’Neill Bike Path. She has long advocated locally and at the state level for bike path development, and made a strong push for the Green Economy bond as a member of the House Finance Committee and its environment and transportation subcommittee. The Department of Environmental Management announced this week the details of $10 million in investments in bike paths across the state that will be funded by the $35 million Green Economy bond approved by voters in November. The money will fund 10 bikeway projects around Rhode Island and create over 10 new miles of bike paths in the state. Included in those funds is $750,000 to fully fund the completion of a .26-mile section of the South County Bike Path connecting it to the Narragansett Community Center. This new section, known as Segment 4A, will take riders safely across Mumford Road and through Canonchet Farm, keeping riders off the road and connecting the community center, which can provide much-needed parking for bike path users. Since the Community Center is also the town’s senior center, its connection to the bike path will provide the town’s seniors with a safe paved path through a beautiful area, said Representative Tanzi. “This is an extremely positive step for an important project for the town of Narragansett,” said Narragansett Town Manager James M. Manni. Also included is $2.2 million to create the “URI Connector,” 2.1 miles of path that will connect the South County Bike Path to Flagg Road, which runs to the University of Rhode Island’s South Kingstown campus. With an additional $400,000 committed by URI, the project’s estimated $2.6 million cost will be fully funded. Besides providing the URI campus with access to the path, the segment will also connect West Kingston Elementary School, which will finally provide students there a safe way to bike to the school, Representative Tanzi said. Although funded by different sources, the state will also soon be embarking on another expansion of the South County Bikeway, the South County Commons bike spur. That project will create a 3,400-linear-foot bike path connector from Broad Rock Middle School’s Athletic Fields and the senior center to the South County Commons. Its costs will be funded through a $400,000 recreational acquisition and development grant from DEM and $175,000 from the Town of South Kingstown. “In a time of shrinking federal dollars for environmentally friendly projects such as bike path development, it is important for Rhode Island to make investments in projects like these. Our state’s bikeways have been in development for decades, and every expansion means Rhode Islanders have better access to opportunities for healthy recreation and transportation as well as appreciation of our state’s natural beauty,” said South Kingstown Councilwoman Liz Gledhill, who has been an active participant in planning for the further development of local bike paths.